Reading the Fantastic Four comics from the start. Issue #398 starts tying together plot threads from previous issues so things start making more sense now… or do they? Gimmie a gimmick: This is the first of three covers to feature a “rainbow foil” cover, in a frame around the characters for an “iris in” effect. The frame will larger and larger over the next two issues, so it feels like the pressure is closing in on our heroes. There was a separately-sold regular cover for those who didn’t want to spend extra money on shiny foil. The FF, Kristoff, and Nathaniel Richards are aboard the FF’s ship, the Stealth Hawk, flying to the moon to confront the Watcher. We begin with Kristoff, Nathaniel and Sue examining the alien device that the Watcher left behind for them to find in the previous issue. 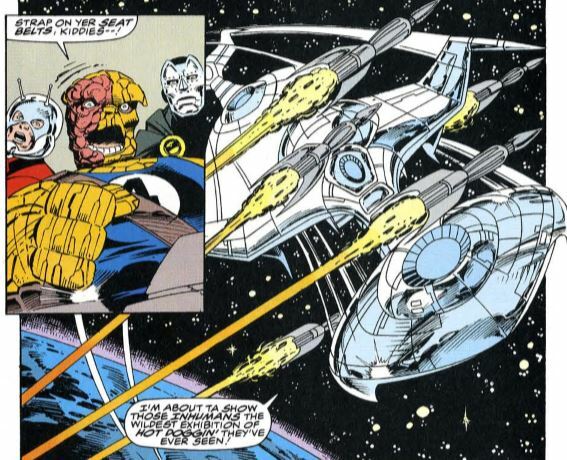 Using intellect equivalent to Dr. Doom’s Kristoff believes the device is one component of a larger weapon, which would possibly destroy an entire solar system. Sue is wary of Kristoff and warier (is that a word?) of Nathaniel, warning Nathaniel to keep his mitts off of the device. In the pilot’s seat, Ben announces trouble. On the moon, in the Inhuman’s domed city of Attilan, General Ator is currently in charge after the Royal Family split for Earth he believes that the FF are his enemies, and he orders his troops to open fire. The Stealh Hawk lives up to its name and goes into stealth mode, sneaking past the Inhumans and landing outside the Watcher’s home. Everybody goes out to investigate, leaving Kristoff’s servant Boris behind with the ship, hinting that something suspicious is up with Boris. They enter the Watcher’s home, take a moment to stare in awe of how weird it is in there, and then they confront an image of the Watcher, who tells them they will not find what they seek. 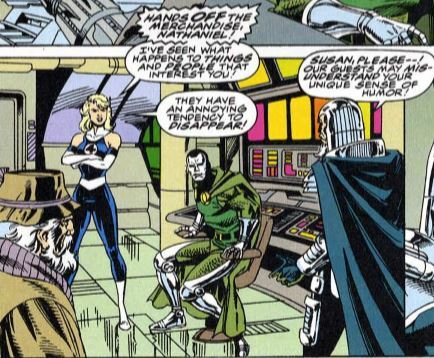 Sue demands answers, saying the alternate timeline of the “Nobody Gets Out Alive” story doesn’t add up, and Ben adds that they don’t know if this is Uatu, Earth’s Watcher, or the other one who attacked the FF in the previous issue. Rootar the Irresistible, an alien tree man who is not Groot. Eelak the Agile, a slippery jumping lizard man. Pulssus, a glowing electrical guy. Glaboo, a big slime/mud monster. Inside the Watcher’s home, Nathaniel sneaks off by himself to check out the Watcher’s otherworldly wonders, in pursuit of his “true mission.” In the main room, a hole opens in the fabric of reality, and out walks another Watcher, named He-Who-Summons. This guy says Earth is no longer of consequence, and only “the one” matters now. Both Watchers disappear, but not before leaving behind another alien device, which Sue calls a trail of breadcrumbs. The spacetime rift that the Watcher left through is still open, and Sue wants to follow, but Nathaniel returns and says they mustn’t. Then the mysterious apparition of Sue from another timeline appears, saying they must trust Nathaniel. Kristoff doesn’t buy it, saying the apparition could have come from anywhere — or anyone. Then the Watcher reappears, saying the universe has reached a pivotal point. 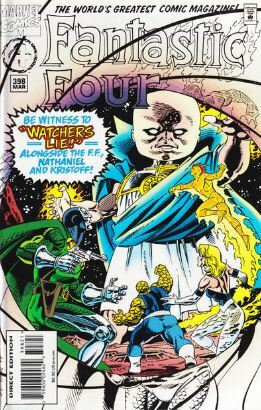 Ben somehow deduces that this is not Uatu, but the Watcher imposter that attacked the FF last issue. 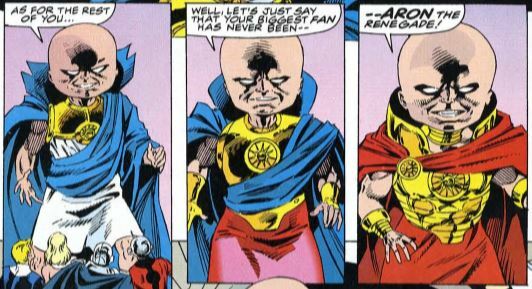 Then it’s time for the big reveal, this is not Uatu but… Aron the rouge Watcher, who has been menacing the FF off and on for the last hundred issues or so. Ben attacks, and Aron blasts him out of the building. Aron announces that all of reality is about to end, and it’s too bad that the FF won’t be alive to see it. Outside, on the moon’s surface, but still within the Blue Area with its breathable air, Ben finds himself surrounded by the Inhuman Attack Squad, ready for a fight. Nathaniel Richards, meanwhile, conveniently teleports back to Earth, to the lab in Castle Doom. There, it is revealed that the apparition of Sue is a fake, and that Nathaniel is the one who’s been making it appear before our heroes, telling them to trust him. He shuts off the apparition, saying that he’s going to need someone “courageous, powerful, and naïve” to defeat a rogue Watcher, and he says he knows just the person. Fade out: Sue frets about teaming up with Kristoff saying the FF knows almost nothing about him (not quite true) and she wonders if the kid could be a true ally. Clobberin’ time: Ben is once again an expert pilot, outmaneuvering the Inhumans’ missile attacks, saying he’s having fun doing so. Flame on: Johnny doesn’t speak during the flight to the moon, his mind elsewhere. The other suspect that he’s dwelling on Lyja, but we never learn what’s really on his mind. 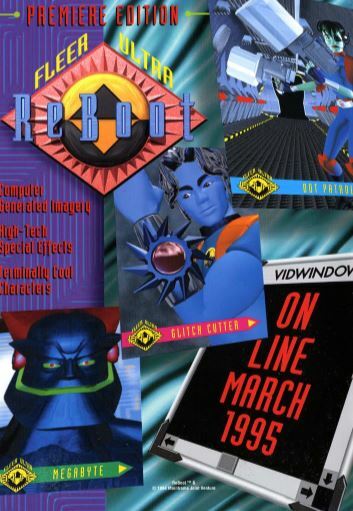 Commercial break: Was Reboot really as great as its fans say it was, or was it merely an OK show with occasionally great moments? Trivia time: OK, let’s attempt to sort out continuity. The Watcher who’s been showing up since “No One Gets Out Alive” (NOGOA) has been Aron the whole time. This tracks, as Aron’s whole deal has always been to trap the FF in a world of his own creating, usually based on the 1960s version of the characters, hence the 60s-style timeline of NOGOA. 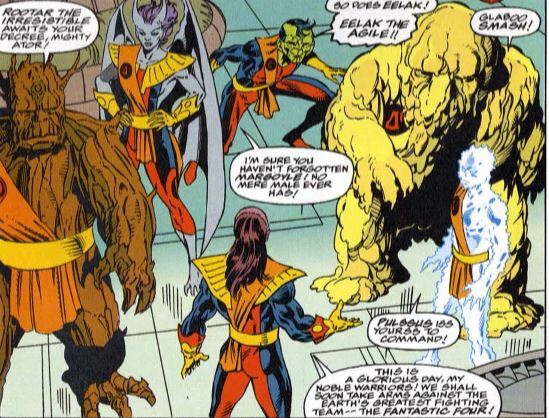 The apparition of Sue seen in NOGOA was indeed from the alternate timeline, but the apparition seen in issues #387 to the present was created by Nathaniel to mess with our heroes. There, everything makes sense now. The Inhuman Royal Family were exiled to Earth in Fantastic Four Unlimited #2 by the Inhuman Genetic Council, who are currently running Attlian. Ator makes reference to this in this issue when he attacks the FF. Fantastic or frightful? Aside from the big reveal about Aron and the first appearance of some fun new Inhumans, there’s not much that happens here. It feels like the creators are just checking off boxes to set things up for issue #400 and the big finale in #416. So, another shrug.